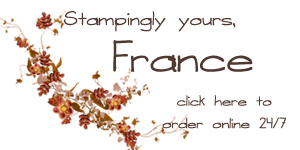 Today is stampin’101 the basic with punches. In the video on my blog at www.frenchiestamps.com you will see how to make a frame, layers and boarder with punches. Like I mention in the past Stampin’101 is all about the basic but I bet you will find some great tip in this video. For today card I use many punches so here is the list of punches that I use for both cards, yes I have 2 cards very similar but a few extra punches on the bottom one. I hope this inspired you to get you punches out and start punching. It’s so many thing we can do with punches but this is only the basic for out stampin’101. Enjoy and have a great day!